I chose the basic Kindle because that’s exactly what I wanted — a bare-bones e-reader. I have no need for a tablet or anything of the sort. This Kindle delivers on that front in every way possible. 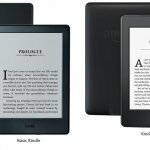 The basic Kindle is now into its eighth generation and shows no signs at all of fading in popularity. Where earlier iterations of Kindle had a D-Pad paired with physical buttons for turning the page, Kindle now has the same touchscreen as its bigger and more expensive stablemates. If you are thinking of switching from a tablet or cell phone to an e-reader, Kindle makes an ideal, cost-effective starting point. With an entry-level product, you obviously won’t get the wide-ranging functionality of the more expensive Paperwhite, Voyage or Oasis. Then again, not everyone wants to spend iPad money or to have a reading device laden with features they won’t really take advantage of. 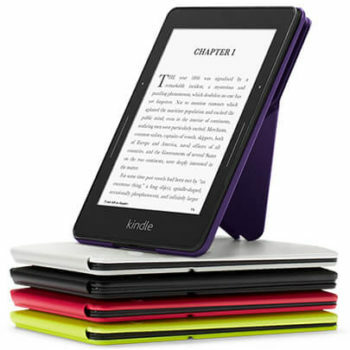 Now available in black or white to suit your taste, this no-nonsense budget Kindle is now finished in a matte plastic. While this is arguably a little trickier to grip than Paperwhite’s softer rubber, the rounded edges lend well to longer, one-handed reading sessions. With a simple Amazon logo on the back, Kindle Basic is an exercise in pared-down minimalism. If you are looking for an e-reader that does the job without any frippery, this starter model might be just what you’ve been looking for. Measuring in at 6.3 x 4.5 x 0.36 inches and tipping the scales at just under 6 pounds, Kindle Basic has a tiny footprint. This eighth generation is 16% lighter and 11% thinner than earlier models showing Amazon’s commitment to improving your experience with each successive Kindle launched. This Kindle is more angular than before but also very slightly larger and heavier. Given the absence of physical buttons, this comes as something of a surprise. Equipped with a 1Ghz processor from Freescale and 512 MB of RAM, Kindle Basic is a full 20% faster than the previous generation. There is none of the noticeable delay when turning pages or navigating that tended to sour the experience with older Kindles. This added pace really comes into its own when you are typing. Lag-related typos are a thing of the past and you can work your way around Kindle pretty seamlessly. It must be pointed out that while it’s a marked improvement on older basic Kindles, you won’t get the same pace as you find on Paperwhite, Voyage or Oasis. You can hook up Kindle to your PC if you want to drag and drop files onto your device. Kindle is fully compatible with an array of files including Mobi, PDF and simple .txt files. You will not be able to access ePub files. Sorting your e-books is a streamlined process. You can sort through by author or title. Depending on your preference, you can display them with cover art included or as a basic list view. If you want to switch from the e-books stored on your Kindle to those you have on Cloud, just tap at the top of the display. Adverts are placed so they do not get in the way. Any book recommendations pop up at the bottom of the home screen. If this is not to your liking, you can disable them by paying for the ad-free version. An easily-activated Airplane Mode helps you to further prolong the already impressive battery life. Overall, for a budget-conscious e-reader from a brand like Amazon, there can be no real complaints about either the interface or the performance of Kindle Basic. The touchscreen adds a new dimension to this base model. There’s no more hitting buttons to turn the page, just tap the side of the screen instead and over you go. Tapping on the right portion moves you forward while the left side of the screen allows you to go back whenever you need to. You can flick from chapter to chapter without any fanfare. Alongside simplifying page turning, you can also look up any unfamiliar words by tapping them rather than the more laborious process on older Kindles. Highlighting and adding notes is equally painless. For anyone reading for academic purposes, this is a giant leap forward. Font size and style is a touch restrictive in common with all Kindles. There are only 6 fonts to choose from in 8 different sizes. As with all aspects of this basic Kindle, you might hanker after more choice but you have all main bases covered. Margins and line spacing can be fine-tuned with ease. Not everyone wants to read with the book oriented in the same way. Amazon lets you flick between portrait and landscape to further enhance your reading pleasure. Some books lend themselves better to being read in one orientation so you won’t need to compromise. The main point to reiterate regarding the general reading experience is the absolute purity of a device designed with a single purpose in mind. When you keep that in mind, many of the minor niggles fade into insignificance. One of the key selling points of all e-readers is their staggering battery life. Where other devices are measured in hours or days, Kindle will keep going for weeks without any need for a boost. According to Amazon, you can get up to 4 weeks of life from Kindle if you read for 30 minutes a day with WiFi switched off and the brightness at the halfway point. If you prefer marathon reading sessions, you could keep at it all day before you reach for the charger. A percentage readout rather than a meaningless bar ensures you can get a handle on how much battery life remains taking the guesswork out of things. If you are used to the deficient battery life of most tablets and laptops, Kindle Basic will come as a nice surprise. It stands to reason that anyone in the market for a dedicated e-reader places a premium on the availability of books and also on storage. 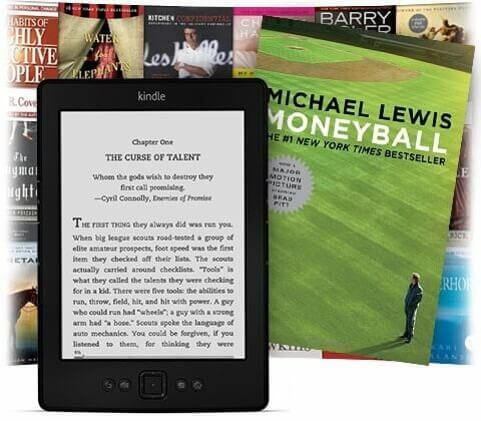 The Amazon Kindle Store is stuffed to overflowing with 2.5 million titles. To put that figure into perspective, the average public library has perhaps 10,000 books. Part of the attraction of buying Kindle books is that they’re very reasonably priced indeed. These days, buying a book, particularly a hardback, is an expensive undertaking. Throw into the mix the fact that you might not even like it and it’s something of a gamble. With Kindle, there’s no such risk. Order and download a free sample or avail yourself of the cut-throat pricing and simply take a chance: the choice is yours. Accidental purchase while navigating can be easily negated with a simple cancellation feature. This is especially valuable if your kids end up using your device. Storage on older Kindles was 2GB. This has now been doubled. Although 4GB might not sound like any great shakes, e-books are tiny files so you’re looking at the ability to hoard thousands of books. Should this not be enough, you can take advantage of Cloud storage and further bolster your collection free of charge. 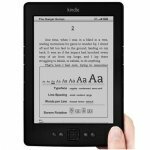 Is Kindle Basic a General Media Device? It would seem cheap to refer to Kindle as a one-trick pony since that phrase can have negative connotations. Effectively, though, it does one job and it does it very well. Kindle is not compatible with mp3 or mp4 files nor can you listen to audiobooks or play games. That, though, is part of its attraction. When you’re reading on a tablet, it can be tough to stay on task even if you are engrossed in your book. With the temptation of Facebook and YouTube a swipe and click away, it’s often easy to get sidetracked. Also, all of the R&D money spent on Kindle is poured into optimizing that one job, reading, so that you get maximum functionality and user-friendliness at a budget-friendly price. What Else Rates a Mention? What’s The Downside of Kindle Basic? If you’re accustomed to the speedy navigation offered up by most contemporary tablets, Kindle Basic might feel slightly clunky. That said, it’s a significant improvement on earlier models thanks to an uprated processor. For anyone starting out with their first e-reader, the display resolution will seem more than adequate. 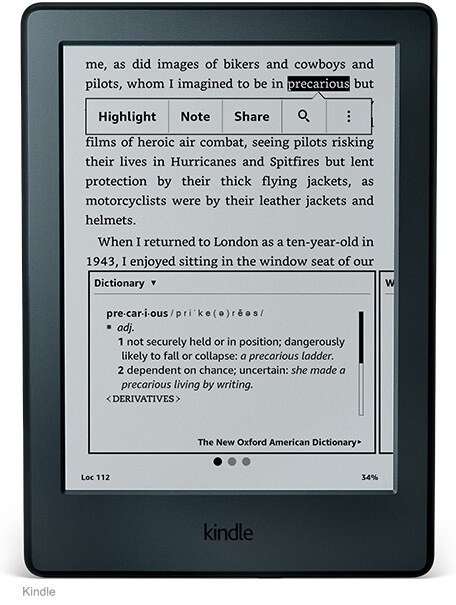 If you have dabbled with the crisper screen on Kindle Paperwhite, Voyage or Oasis, the 167ppi might feel lacking. If you hold the device pretty close then there’s no problem although at more of a distance, the text can appear blurry. The lack of waterproofing could be dicey if you often read in the bath. Night owls will need to make sure there’s a reading light handy as you can’t read Kindle Basic when it’s dark due to the lack of front light. For charging purposes, there’s a micro-USB cable but no adapter so if you want one of these you’ll have to pay extra. While none of these drawbacks are catastrophic, it’s better that you’re fully aware so you can then buy knowing exactly what’s what. If you are on the hunt for a simple but effective e-reader that gets the job done without costing you a fortune, Kindle Basic is the go-to option with just cause. You’ll benefit from Amazon’s first-class ecosystem while enjoying a device that strips away all the distractions and allows you to read your favorite books for hours on end one-handed at an incredibly keen price point. Kindle Basic continues to evolve without compromising the purity of this entry-level e-reader. Check one out today and you will not be disappointed. Last updated by David Richardson at October 23, 2017 .